The Coma galaxy cluster is a collection of more than 650 galaxies about 300 million light-years from Earth in the constellation Coma Berenices. Also known as Abell 1656, the galaxy cluster is one of the densest ones known. A vast cluster of dead galaxies roughly 300 million light-years from Earth may hold as much as 100 times more dark matter than visible matter, researchers say. This discovery sheds light on how dark matter can shape the evolution of galaxies, scientists added. Although these 47 galaxies are about as large as the Milky Way, they surprisingly contain only 1 percent as many stars as our home galaxy — a discovery made last year by astronomers in the United States, Canada and Japan using the Dragonfly Telephoto Array in New Mexico. This array of eight connected Canon telephoto lenses helped to detect extremely faint objects that conventional telescope surveys miss. The gravitational pull of stars normally helps to hold galaxies together. However, these 47 galaxies are spread out extremely thin, making them highly vulnerable to getting ripped apart by the gravitational pull of other galaxies and dark matter within the cluster, the scientists found. Dark matter is a mysterious substance thought to make up about 84 percent of the matter in the universe, and while dark matter is invisible, its presence can be inferred by its gravitational effects on visible matter. "We would not expect to find these objects survive for long in the Coma Cluster," said study lead author Cameron Yozin, a doctoral student at the International Center for Radio Astronomy Research and the University of Western Australia in Crawley. "Their unusual properties stimulated a debate as to how they fit in with our broader ideas of galaxy formation and evolution." Now, using powerful computer simulations to model the evolution of these galaxies, the researchers suggest these galaxies must be packed with dark matter. 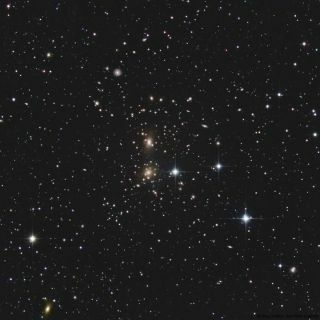 "These galaxies could have survived in the cluster for a long time if protected by an immense amount of dark matter, approximately 100 times as massive as the combined mass of their stars," Yozin told Space.com. For comparison, the Milky Way has about 10 times as much dark matter as visible matter, Yozin noted. This graphic depicts the "quenching" process, showing how a normal star-forming galaxy (in blue), loses its gas while falling into the Coma galaxy cluster. These 47 galaxies are red, which means their stars are old and that these galaxies have not formed new, bluer stars for a very long time. Yozin said this suggests these galaxies fell into the Coma Cluster as many as 7 billion to 10 billion years ago, with hot gas in the cluster pushing out cold gas in these 47 galaxies that might otherwise have helped these galaxies form new stars. This end to star formation is known as "quenching." "The growth of galaxies can be stunted early on if they happen to fall into the densest regions of the universe, such as the Coma Cluster," Yozin said. The research team's calculations found that these "failed" galaxies were not torn apart within the cluster because they had enough dark matter to protect their visible matter. "These galaxies may have originally had as much dark matter as a larger galaxy like our Milky Way has but have formed far fewer stars, giving rise to a significantly large dark-matter-to-visible-matter ratio," Yozin said. Since these 47 galaxies were discovered, nearly 1,000 large, faint galaxies "have been detected in the Coma Cluster alone," Yozin said. "As further observations are made, we expect to find many similar objects with large dark-to-visible-matter ratios," Yozin added. Yozin and co-author Kenji Bekki, of the International Centre for Radio Astronomy Research and the University of Western Australia, detailed their findings online July 20 in the journal Monthly Notices of the Royal Astronomical Society.